Tofu flavored with soy sauce, onion, garlic, and honey makes an interesting substitute for meat in this jerky recipe. Plan ahead to let the tofu marinate overnight. The drying can be done in a dehydrator or home oven. 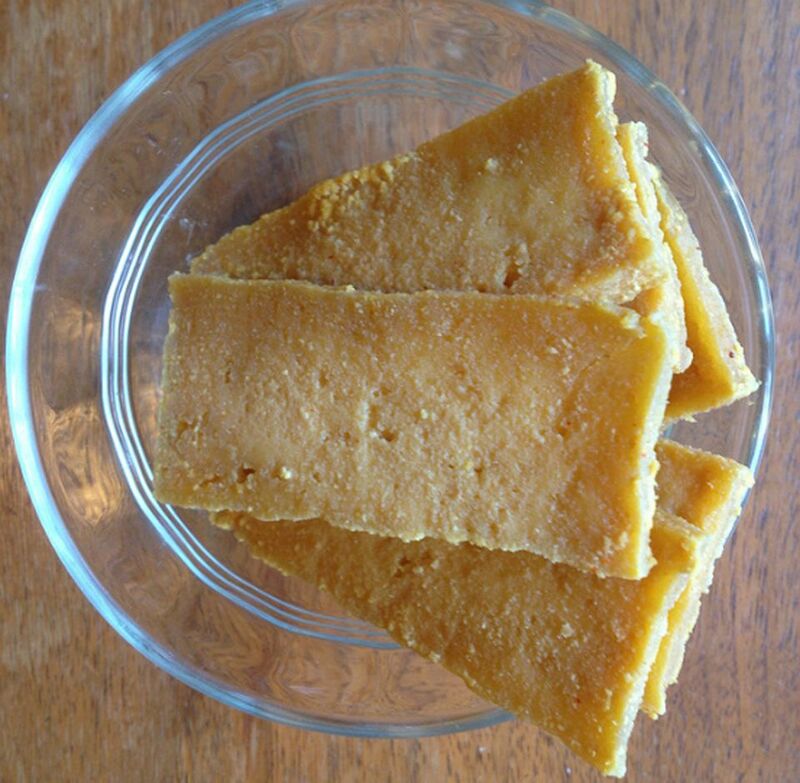 If you have a smoker, you can try drying tofu that way, but then I would eliminate the Liquid Smoke called for in this recipe. Do not use extra smoking chips in your smoker when making jerky. Don't expect tofu jerky to taste like beef jerky or have the same texture. It just won't be the same, but it is chewy and satisfying. And for folks who can't eat meat or won't eat meat, it's an excellent alternative. Take a 1-pound cube of tofu and drain it. Cut it in half, and then slice it into strips on its short side. Strips should be about 1 1/2 to 2 inches in thickness. They may look big, but they will shrink to about half their size. In a small bowl, mix together 1/2 cup soy sauce, 3 to 4 tablespoons liquid smoke, 1/8 cup water, 1 tablespoon onion powder, 1 teaspoon garlic powder or 1 clove crushed fresh garlic, 1 tablespoon freshly ground black pepper and 1 teaspoon honey together until well combined. Place the tofu strips in a single layer in a shallow baking pan or cookie sheet and pour the marinade over it. Let soak for several hours or overnight. Drain excess liquid (may be reused) and dry tofu in a food dehydrator or warm (200 degrees F) home oven. This will take 4 to 8 hours, depending on the weather. If you live in a sunny, hot, dry climate, you can sun dry it outdoors. It will take all day. Flip the tofu over hourly so it dries evenly. Dry the jerky until it is very chewy, but not crispy. Tofu jerky is delicious and keeps indefinitely. Be creative. Use low-sodium soy sauce if you want less salt (the tofu jerky is rather salty). Use Tabasco sauce or ground cayenne pepper if you want it hot. Chili powder makes chili tofu jerky. Oregano and basil make pizza tofu jerky. Recipe Source: Mike Richichi. Reprinted with permission.